04:23 — Doctor Who: Lot of SFX Readers Awards. 06:38 — Torchwood: Russell T Davies to leave after Miracle Day/The New World. 08:29 — Doctor Who: David Walliams to guest in S6. 10:34 — Doctor Who: Brian Cox wants to guest. 11:03 — Death: Margaret John. 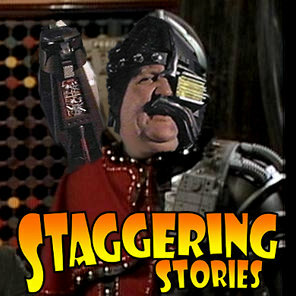 12:28 – Fight Club: William ‘The Shat’ Shatner vs the Clangers. 16:27 – Feedback, part one. 24:33 – Feedback, part two. 41:31 – Escape Pod Discs: The Head of Pertwee. 46:53 – Feedback, part three. 54:25 – Fight Club: The Head of Pertwee vs Sootie. 58:38 – 30 Second Recommendation: Crumbly and Fake Keith recommends Eastenders. 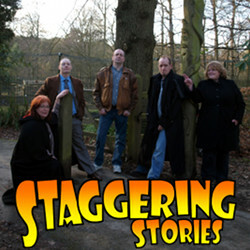 59:40 – Choose Your Own Staggering Story! 60:59 – Feedback, part four. 68:42 – Gallifrey 2011 Messages. 93:09 – Farewell for this podcast! 94:03 — End theme, disclaimer, copyright, etc. Professor Dave’s Ark in Space. Adam J Purcell, Andy Simpkins and Keith Dunn sit down, flatuated, in front of the 2005 Doctor Who episode, World War Three, and spout our usual nonsense! BBC: Doctor Who – World War Three. Adam J Purcell, Andy Simpkins and Keith Dunn sit down, space pigged, in front of the 2005 Doctor Who episode, Aliens of London, and spout our usual nonsense! BBC: Doctor Who – Aliens of London. 02:57 — Doctor Who: Loses out at the ‘National Television Awards’. 06:10 — Doctor Who: Character Options to release ‘Lego-like’ sets for Doctor Who. 08:07 — Red Dwarf: Dave commisions a new series. 10:33 —– Sanctuary: Getting a fourth season but back to 13 episodes rather than 22. 10:40 —– Discworld: Terry Pratchett’s Unseen Academicals to be fourth TV adaptation. 10:45 —– Primeval: Ratings beginning to recover for season four. 10:51 —– Battlestar Galactica: New MMO nears release. 11:12 —– Pirates of the Caribbean: Fifth film already being considered. 11:49 — Superman: British actor Henry Cavill cast as Superman in new film. 12:52 — Being Human: Online series ‘Becoming Human’ has begun. 13:12 — A Madness of Angels: New film adaptation on the way. 14:34 – Podcast 100 Promo. 15:38 – Doctor Who Quiz: Who will represent us again The Doctor Who Podcast ? 30:15 – Podcast 100 Promo. 31:16 – Doctor Who: The Pirate Planet. 93:42 – Podcast 100 Promo. 93:53 – Farewell for this podcast! 94:37 — End theme, disclaimer, copyright, etc. ITV: A Touch of Frost. Kate Griffin: A Madness of Angels. BBC: Doctor Who – The Pirate Planet.